We are 1.5 mi. north of town on US 67 North & US 60 West across from the Highway Patrol. Camelot is located at the beginning of Camelot Drive. Campground Fronts highways US 60/67. MAP below. Note: We are NOT in a flood area. Going WEST bound on US 60: Take The Springfield/St. Louis Exit onto (60 West/67 North) go 1 1/2 mi. Turn right onto the outer service road, then continue west on outer service road 600 feet to entrance on right at Camelot Drive. 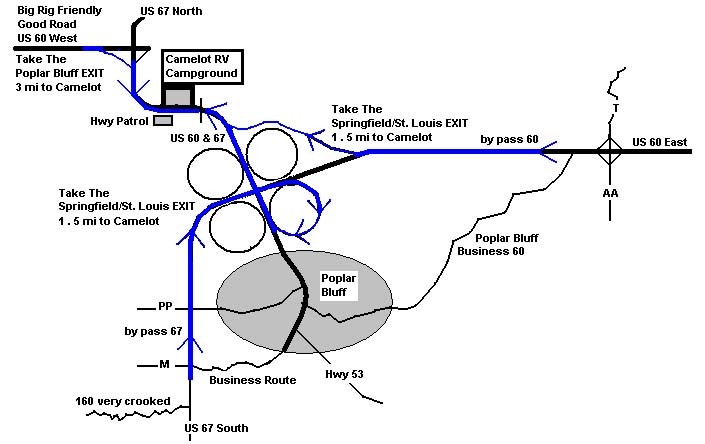 Going EAST bound on US 60: Take The Poplar Bluff Exit onto (60 East/67 South) go 3 mi. Turn left and go across highway to the outer service road. Turn left on the outer service road, go 600 feet to entrance on right at Camelot Drive. Going NORTH bound on US 67: Take The Springfield/St. Louis Exit onto (67 North/60 West) go 1 1/2 mi. Turn right onto the outer service road, then continue west on outer service road 600 feet to entrance on right at Camelot Drive. Going SOUTH bound on US 67: From St. Louis continue on US 67 South we will be on the left just before you reach Poplar Bluff. US 60 is a 4 lane divided highway across Southern MO. US 67 between St. Louis and Poplar Bluff is a 4 lane divided highway.